1. Fighting spirit: When JCB returned to Calcutta after completing BA from Cambridge in 1885, he had a recommendation letter from Viceroy Lord Ripon. Principal of Presidency College didn’t like this and JCB was given a position but at a salary one third the salary of sahib teacher. JCB continued to teach and yet didn’t accept any salary for three years until the Principal relented. JCB received all his arrear salary as a teacher in the senior grade with retrospective effect from the date of his joining the college. 2. Pursuing one’s passion: On his thirty sixth birthday in 1894, JCB took the now famous vow of devoting his life in the pursuit of scientific research. He converted a small enclosure adjoining a bathroom in the college into a laboratory. His productivity as a researcher zoomed during the following year. In May 1895 he read a paper before the Asiatic Society of Bengal; by October 1895 he was able to dispatch to the Royal Society another paper, while three short articles would appear in The Electrician in December 1895. Impressed by his work Royal Society offered him a special Parliamentary grant for his research. JCB would later say, “That day the closed gate opened and for five years this progress was uninterrupted”. 3. 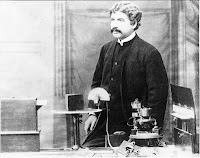 Role of instruments and laboratory: JCB developed extremely sophisticated instruments in his lab like resonant recorder, high magnification crescograph, photosynthetic recoder etc. The resonant recorder could automatically record velocity of excitatory impulse with an interval down to 1/1000th of a second.